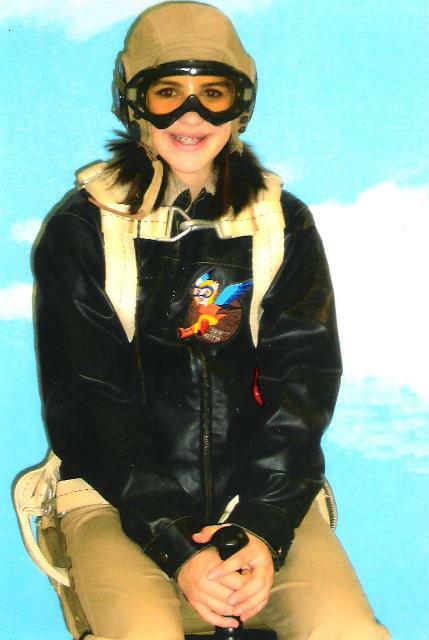 WINGS AND WASP: WASP & FLYGIRLS--What's NEXT! To the WASP and supporters online, a little news from Wings Across America. 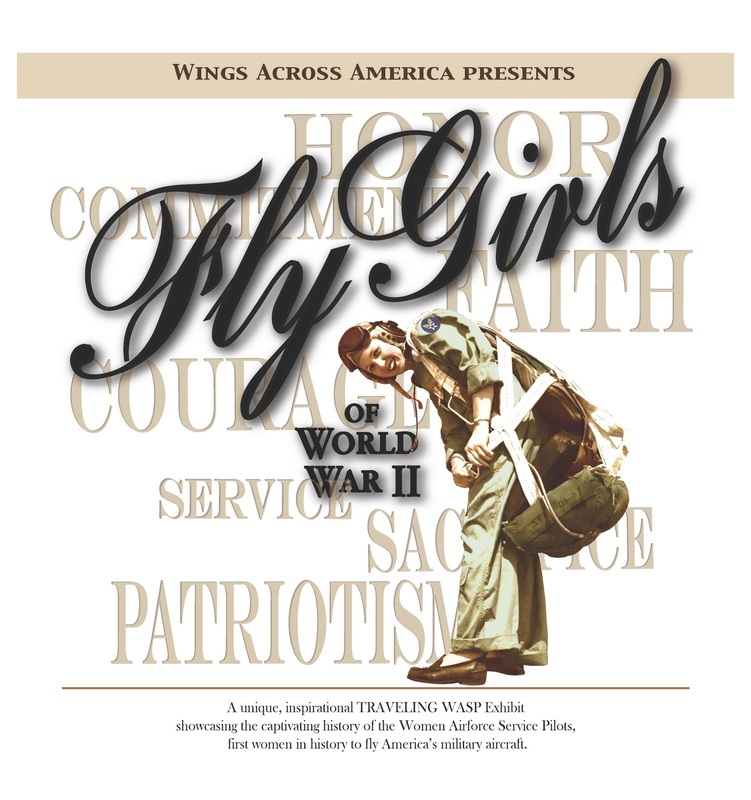 "FLY GIRLS TRAVELING WASP EXHIBIT"
NEXT STOP on the national tour of the The "Fly Girls of WWII" traveling WASP exhibit will be the Kalamazoo AIR ZOO in Kalamazoo, Michigan opening May 31, 2010! Mom & I are DELIGHTED to make this announcement, so that YOU, the WASP, would be the FIRST TO KNOW!. All the other details we will leave up to the Air Zoo’s Public Relations Department. They will soon be releasing more information about the opening of the exhibit and events surrounding the opening. Those of you who heard my speech at the Women's Memorial on March 9 know that I offered the entire Fly Girls exhibit to the US Air Force. General Schwartz, who spoke at the event, was very kind. He nodded, smiled, applauded, and immediately assigned a very nice young woman in his office to head up the project. We have been working with her to find the best way to showcase your history, but we discovered that ‘making this happen’ will take much more time than we expected. 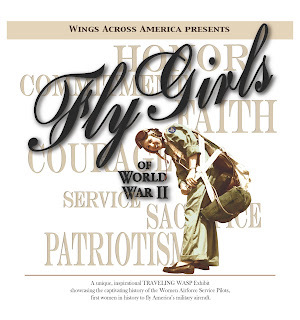 Fly Girls of WWII had been extended twice at the Women’s Memorial--held over for 17 months. The time had come for us to remove the exhibit in order for the Women's Memorial to have room for another traveling exhibit that had been scheduled months before. We were grateful for the opportunity to have the exhibit on display during the Congressional Gold Medal Ceremony, but it was time to take Fly Girls down and move on. We were fortunate to find an exciting and special temporary home for the exhibit --KALAMAZOO AIR ZOO, while we continue to work with the Air Force. During the events in Washington, WASP Sue Parish and her friend, Norm Carver, visited the Fly Girls exhibit and expressed their desire for a chance to display the exhibit at the AIR ZOO, which Sue helped found back in 1977. (It houses her pink P-40!) They were so enthusiastic until they sent the Kalamazoo Air Zoo Director, Bob Ellis, to DC to see the Fly Girls exhibit a few days after they returned to Michigan. 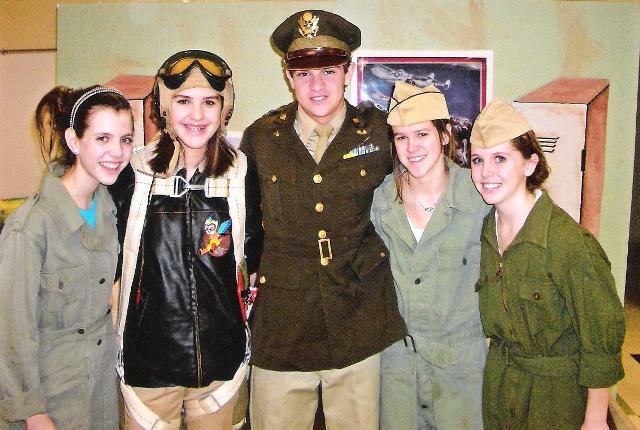 Bob's enthusiasm for showcasing the Fly Girls exhibit in their beautiful facility was perfect timing! The Air Zoo is an EXTRAORDINARY, "outside the box, state of the art" inspirational, entertaining and educational experience of EVERYTHING AVIATION! 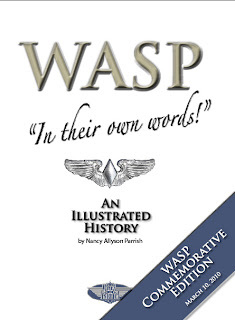 "WASP IN THEIR OWN WORDS--AN ILLUSTRATED HISTORY"
The WASP Commemorative Edition of my new book, "WASP In Their Own Words," was given as a gift from Wings Across America to the WASP who attended the Congressional Gold Medal ceremony in DC. This limited first printing was only for the WASP. Additional opportunities to order more books will be announced on-line shortly, along with more specific information on the book. THANK YOU TO ALL OF YOU for your prayers, cards and emails for Paul & Nicole Malachowski and their expected TWINS! My last email from Nicole was from her hospital bed-- where she will be until the twins are born. She is ‘hanging tough’, doing everything to ensure those little babies stay right where they are for as long as possible. "Thanks for passing on all the kind emails from the WASP network...they make me smile. Also, I got 20+ cards in the mail today from WASP and families. Really made my day! --Nicole"
On Saturday, May 7th, students from Mr. Degner's 8th grade American History class from Boerne Middle School North, Boerne, Texas, will compete in the 30TH ANNUAL TEXAS HISTORY DAY contest, at the University of Texas in Austin. The students are hoping to advance to the NATIONAL HISTORY DAY contest at the University of Maryland in June, 2010. The student's project on the WASP is a wonderful example of how the history of the Women Airforce Service Pilots has inspired these students and can inspire generations to come. Please read on to find out more about these great kids! Each year Middle School teacher, Bryan Degner, assigns his 8th grade American History students a project that must follow the guidelines of the National History Day (NHD) contest. The students have five categories to choose from and their topic must relate to the theme provided by the NHD. 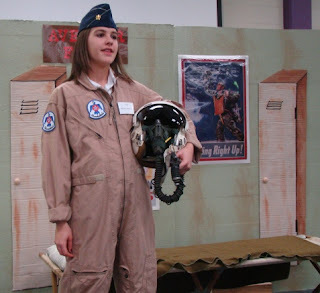 This year’s theme is “Innovation in History, Impact and Change.” A group of 8th graders selected the WASP as their topic because they believed that using women pilots to fly military aircraft for the Army during World War II was an innovative idea and the WASP had a tremendous impact on military aviation. 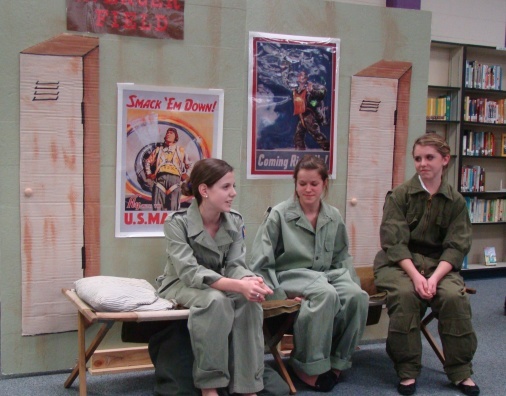 In order to educate people and bring the story of the WASP alive, these five students decided to enter the performance category. They conducted hours of research reading books, magazines, and newspaper articles but their best source was the WASP themselves. The students interviewed eight WASP either over the phone, email or by letter. The information they gathered was used to write a script for a 10 minute performance that depicts the history of the WASP. These students won 1st place at their school history fair and 2nd at the San Antonio Regional History Fair. On May 7, 2010 they will compete at the Texas History Day contest and hope to advance to the national contest at the University of Maryland in June. Callen: I think the history of the WASP is important. These women made a difference when some people weren’t ready for women to serve in the military. It’s because of the WASP that women have opportunities in military aviation. The thing that impressed me the most about the WASP was how strong and determined they were. They served their country not for recognition but because they loved to fly and wanted to do their part during the war. Connor: One of the things I learned about the WASP was how tough these women were and how they were forgotten for so long. Speaking with the WASP was a great honor and it was a lot of fun listening to their stories. Caroline: I think the history of the WASP is important because they showed that women are just as brave and hard working as men. We didn’t know the WASP were going to receive the Congressional Gold Medal when we started the project. 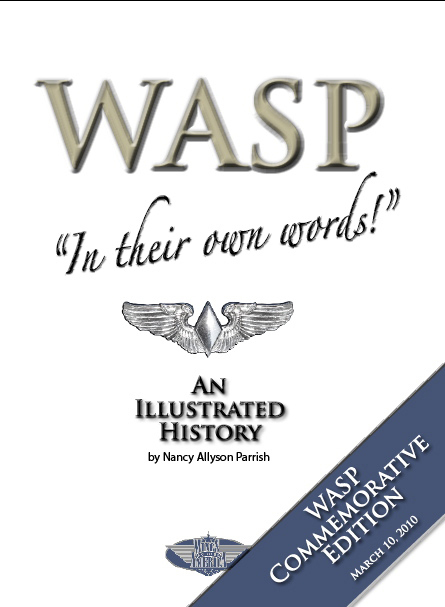 It has been an honor to share the story of the WASP with many people that had never heard of them. Emily: I learned from this project that women can be just as strong and determined as any man. Thank you, WASP. Heather: One of the fun things about this project was dressing in the zoot suits and performing at competition. One of my favorite memories was hearing Mrs. Rosa Lea Meek tell us that before she left Love Field they were told to “go home, marry your high school sweetheart and have babies.” It’s hard to believe that was the way women were thought of. GOOD LUCK TO CALLEN, CONNER, CAROLINE, EMILY AND HEATHER! LET THE CAN DO ATTITUDE OF THE WASP, THEIR PATRIOTISM AND THEIR SPIRIT BE SHINING BRIGHT IN YOUR PERFORMANCES. FOR ALL OF US, YOU ARE ALREADY WINNERS! That's the news for now-- God continue to bless you all, everyone!